I just wanted to take a moment and thank you for posting my inquiry on the Sony 7600GR. The post comments answered my question. I also wanted to let you know your confidence in Ebay seller Anna and Anon-co continue to be well founded. 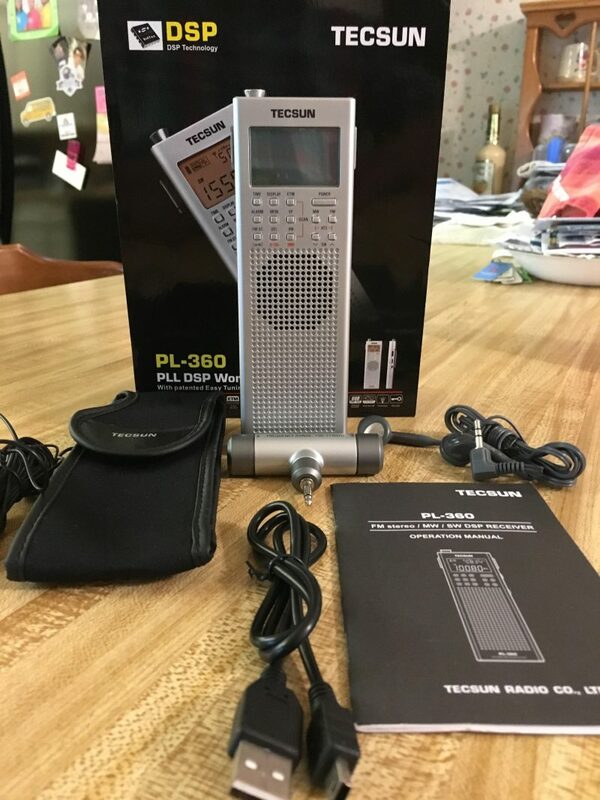 Remembering your recommendation and wishing to pick up a Tecsun PL-360 as a spare to my CountyComm GP-5 SSB (Tecsun PL-365), I placed the order for it and a couple of other bits of Tecsun kit with Anon-co. The order arrived in 6 working days to my Gulf coast Texas home, taking longer to travel from Chicago to my home than it took to move from Anon-co in Hong Kong to Chicago and clear customs. I then had a question about the connecting cable included with the Tecsun badged, Tecsun / Kato / Grundig / Eaton, AN200 Loop Antenna. Posed through Ebay Anna promptly answered the question and added a photo of the cable to Anon-co’s Ebay listing for the AN200. It just doesn’t get better than that. You can continue to recommend Anon-co with full confidence from my perspective. I picked up the PL-360 as a lower cost AM/FM/SW backup to the GP-5 SSB that would allow me to accept the risk of using the larger and heavier extended ferrite rod loop stick aftermarket antenna that garnered so much interest on your blog a year ago, before CountyComm warned of accelerated wear on the antenna jack. Happily the antenna works just as well on the PL-360 as it did on the GP-5 SSB. Overall I am pleased with the PL-360. The performance on AM and SW appears to match that of the GP-5 SSB (Tecsun PL-365) albeit with a slightly higher noise floor. Whether this is due to something akin to sample to sample variation or a direct result of inherent design differences between the PL-360’s Silicon Labs Si4734 DSP chipset versus the GP-5 SSB’s Silicon Labs Si4735 DSP chipset I can’t say. I can say the PL-360 with the included High Gain loop stick external tee antenna received my list of news gathering AM clear channel stations out to 900 miles during the night hours matching the GP-5 SSB. This list includes WGN, WBBM, WLS and KOA at the furtherest extreme. It also includes Mexico City’s XEEP 20kW at night at 800 or so miles. Switching to SW broadcast using the whip antenna and Tecsun’s / CountyCom EZTune system day or night the PL-360 and GP-5 SSB select and load the same stations within the PL-360’s slightly shorter SW tuning range. Dittio on FM on the whip. Both radios snag my list of FM stations out to 60 miles. For my purposes both are extremely close in performance to my Sony SW7600GR when using their supplied external loop stick. On AM if you combine one with the larger and heaver aftermarket loopsticks they will slightly outperform the 7600GR combined with a Tecsun / Kato / Grundig / Eaton, AN200 Loop Antenna. The Sony’s speaker gives it the edge in listening pleasure, but on earphones or plugs all three are close. None of forgoing addresses the SSB performance as the PL-360’s chipset doesn’t offer that option. I am pleased with the PL-360, Anna and Anon-co and I do thank you for posting my 7600GR inquiry. I look forward to your blog. Thank you, Steve! I’m happy to hear the 7600GR posting helped you–that’s what this community is all about…helping each other. Thanks to everyone who commented on that post. I’m also happy to hear you’re enjoying the PL-360 and that you understand the risk of using the large ferrite bar on this radio series (PL-360, 365 and GP5 DSP and SSB). I use my antenna as well, though like you, very carefully. I only use the large ferrite bar when I’m stationary and I’m careful not to put a strain on the antenna in any way; keeping it balanced and steady. In other words, you must handle it with kid gloves. If you take these precautions, I think your radio will enjoy expected longevity. Thanks, again, Steven for sharing your review! I’m very pleased to hear you’re enjoying the SWLing Post! This entry was posted in AM, Antennas, News, Portable Radio, Radios, Retailers, Reviews, Shortwave Radio Reviews and tagged Anon-Co, CountyComm GP5/DSP, eBay, ferrite antennas, Reviews, Shortwave Radio Reviews, Steven Crawford, Tecsun PL-360 on April 21, 2017 by Thomas. 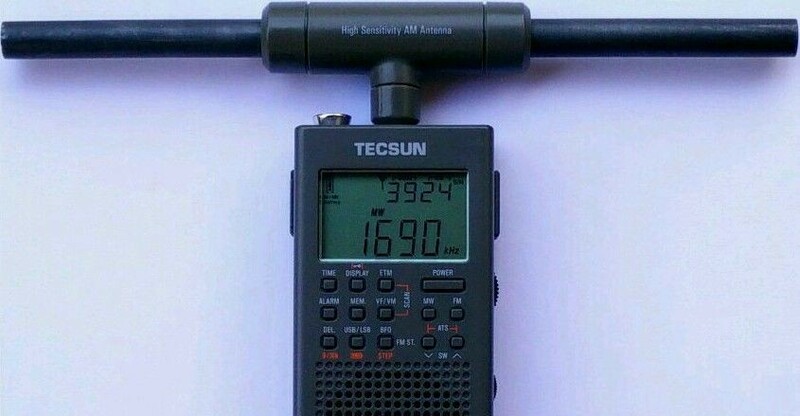 After sending Thomas my thanks for posting my SW7600GR inquiry I discovered what I have come to consider a fine stand for the Tecsun PL-360, PL-365 and CountyComm GP-5 SSB when using it out of the hand. The ever humble 5″ tall metal bookend. Just slide the belt clip onto the stand, make a stable setup even when using the large aftermarket ferrite loop-stick. It’s easy enough to add a bit of weight to the stand’s feet when a little side load from an external reel antenna is clipped to the whip. Nothing special about the one in the link, just using it as an example. Oh now that’s a bit of genius, Steve! Could you send me a photo of your radios on the stand? I’d like to post this. This would make it a much more stable as a bedside radio. After I purchased this same radio few months ago I noticed that when using Degen loop with this radio it will give an excellent reception. I haven’t since used Tecsun AN-200 loop or the loop I built myself (now put to pieces and forgotten). Very nice small and compact radio with excellent price tag. I haven’t regretted a single moment since I received it.